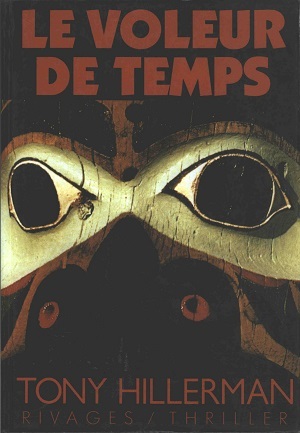 This is the first French paperback edition of A Thief of Time. This edition was published in 1989 by Rivages in Paris, France. This edition was translated from Tony Hillerman's original English text into French by Danièle and Pierre Bondil. The cover photograph depicting a Kwakiutl totem pole carving was created by D.R. Format: Paperback, 22 x 15.2 cm. Binding: Full-color paper covers with the author printed in white, the title printed in red, and the publisher printed in white vertically on the spine.